When you think of Giovanni Trapattoni, it is difficult not to associate his name with over three decades leading some of the world’s most prestigious clubs and sweeping up trophy-after-trophy. However, as the most successful coach in Italian football history turns 80, there are generations of fans that are unaware of the impact that Il Trap had on the domestic game as a player. Born back in 1939, a career within the professional game was far from tactically astute mind of Trapattoni, who began his working life in a local bakery, before beginning what was expected to be a long career as a typographer. While the youngster was arranging the news on his printing press, though, it was his love of football that would provide the pathway to creating the news he would have once set out – continuing to kick a ball round the streets of Cusano Milanino. Walking those streets one day was former AC Milan attacker Mario Malatesta, who insisted that the 14-year-old had the raw materials to make it at the Milanese giants and invited Trapattoni for a trial with the club. It is a storyline that every young Milanese youngster today would dream of, however, father Francesco tried to convince his son not to turn his back on a career with a significantly higher degree of job security. It would be five years before Trapattoni would eventually make his Rossoneri bow in the Coppa Italia versus Como in 1958, after which his father announced his sadness at never getting to witness his son play a competitive fixture for Milan – dying suddenly three days later. Whether his passing drove Giovanni on to have a successful playing career isn’t known, but it would be 1960 before the defensive midfielder would finally establish himself in the Diavolo first-team and also became a full Italian international. In his second full season with Milan, Trapattoni got his first taste of silverware when helping the club win the 1961/62 Serie A title. Acting as the defensive shield, or at times a centre-back himself, and distributing the ball quickly and efficiently to his more attack-minded teammates. 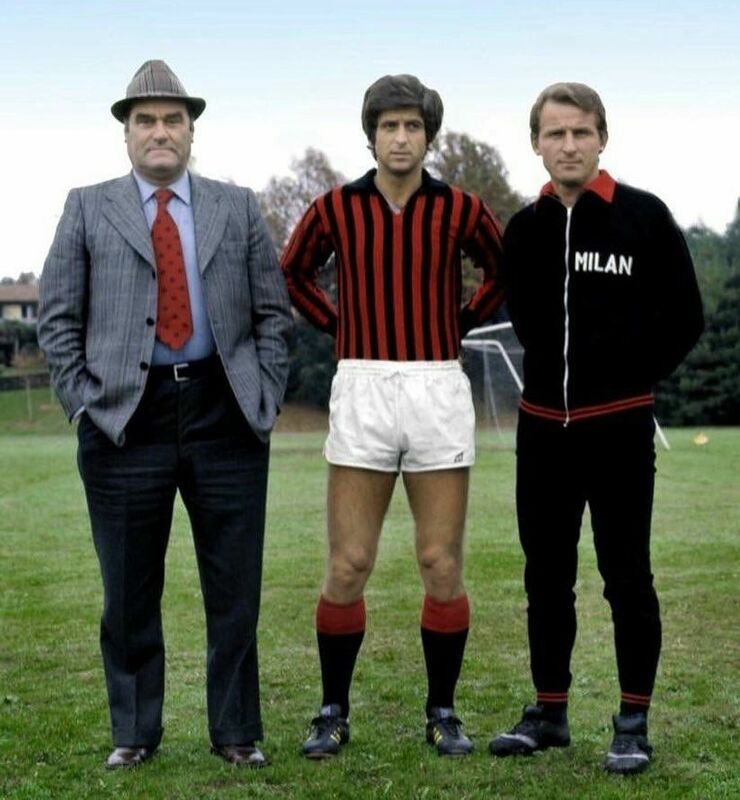 Just 12 months later, though, and within the space of 10 days, came the much forgotten moment when Trapattoni the player became an Italian and Rossoneri legend. When world champions Brazil and Pele arrived at the San Siro on 12 May 1963, it was Trapattoni who was lauded for marking the South American superstar out of the game, although the Santos man played just 23 minutes. Then, at Wembley Stadium in the 1963 European Cup final it was Trapattoni’s heroics that were credited with helping Milan become the first Italian side to lift the trophy, after containing the equally talented Benfica striker Eusebio. With a style that epitomised Italian football during the 1960s and early 70s, he arguably honed his managerial talents, with over 300 appearances in a Rossoneri shirt and claiming another Scudetto and European Cup in 1968 and 1969, respectively. As a fundamental cog of the Milan machine, Trapattoni had something of a habit of winning European trophies as both player and coach and also won the European Cup Winners’ Cup in 1968 following Coppa Italia success against Padova. His importance to the Rossoneri, and ability to carry out his coaches tactical plans on the pitch, probably indicated a career in coaching, but few could have predicted that Trapattoni would have bettered six major trophies in 14 years. However, after taking the reins at Milan at the tender age of 35, a coaching career that took in the likes of Juventus, Inter, Bayern Munich, Fiorentina, Benfica and the Azzurri brought an amazing 22 trophies. Oddly that first appointment started with a European Cup Winners’ Cup final defeat to Magdeburg and lasted less than 10 months, highlighting that, when he was inducted into the Milan Hall of Fame in 2015 it was very much for his achievements on the field not off it.